Do your lips leave you feeling uninspired and wanting more because of their thin shape or unevenness? Do your cheeks need refinement with a little extra padding to reinvigorate shallow or gaunt cheeks or to smooth out wrinkles? At ZO Skin Centre® in Beverly Hills, CA, we have a Juvéderm® product specifically for these aesthetic challenges called Voluma®. Men and women over the age of 21 can augment lips, re-contour facial features, and smooth away fine lines and wrinkles with Voluma®. This product is made of hyaluronic acid, which can aid in the supplementation of collagen loss and rehydrate your skin. Given the opportunity, our talented injectors at ZO Skin Centre® can resupply your skin with fullness and desirability for up to 2 years with versatile Voluma® injections at our office. "I went to the Obagi Skin Health Institute for a consultation with Dr. Bashey two weeks ago and felt he was the "one" to take on my facial concerns.Well, I was right...after getting the fillers Voluma and Vollure for the creases I had on the side of my mouth, my droopy checks and the slight indentations I had under my lips I am a brand new woman! Let me just say this....it's not that I look any different, it's that Dr. Bashey took the time to examine my face and place the fillers where needed. I look REFRESHED. Dr. Bashey was patient with my asking (many) questions, and giving with his answers. I am very pleased with the end result and wanted to give this artist my review :-)Azenath Tovar"
"I went to the Obagi Skin Health Institute for a consultation with Dr. Bashey two weeks ago and felt he was the "one" to take on my facial concerns. Well, I was right...after getting the fillers Voluma and Vollure for the creases I had on the side of my mouth, my droopy checks and the slight indentations I had under my lips I am a brand new woman! Let me just say this....it's not that I look any different, it's that Dr. Bashey took the time to examine my face and place the fillers where needed. I look REFRESHED. Dr. Bashey was patient with my asking (many) questions, and giving with his answers. I am very pleased with the end result and wanted to give this artist my review :-) Azenath Tovar"
Candidates for Voluma® must meet the age requirement to have these injections as the Food and Drug Administration (FDA) has only approved it for adults 21-years-of-age or older. At a consultation, you must present thin or asymmetrical lips, hollowed out cheeks, or wrinkles to smooth. You may also have hydration issues with your aging skin as well as volume loss. As with all of our injectables, a consultation will be required before an injection session can take place. Once it has been determined that Voluma® is the right dermal filler for your skin's condition, a treatment plan will be designed to meet your needs with a precise dosage and strength of the medication. Then, we will prepare your face in one of our treatment rooms (which could be your consultation room). 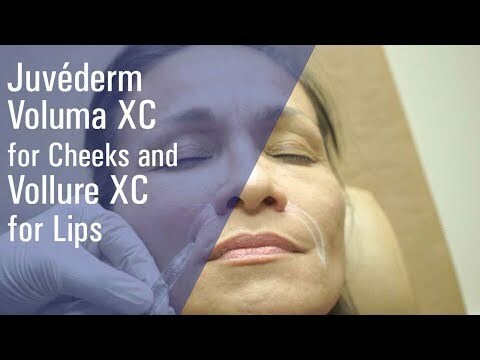 Once the treatment area has been cleansed and marked for injections, our exceptional Voluma® injectors will administer the medication as explained in the consultation appointment. The good news about Voluma® is that it does not take long to see gorgeous results. Before you leave our office, we will invite you to an area to freshen up your face before heading back into your daily schedule. Enhance the apples of your cheeks or your lips for sought-after fullness with injections of Voluma®. We will provide you with a consultation to assess your suitability for this injectable. Call to schedule your appointment, or simply stop by our Beverly Hills, CA ZO Skin Centre® for your cosmetic fillers.